High-power, self-cleaning solar panels might be coming soon to a roof near you. 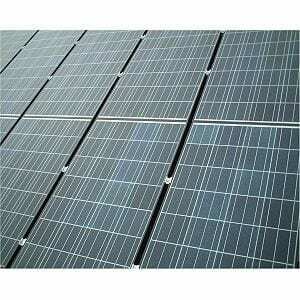 There are two obvious problems with photovoltaic cells, solar panels. First, they are very shiny and so a lot of the incident sunlight is simply reflected back into the sky rather than being converted into electricity. Secondly, they get dirty with dust and debris caught on the wind and residues left behind by rain and birds. Now, research published in the International Journal of Nanomanufacturing suggests that it might be possible to add a nanoscopic relief pattern to the surface of solar cells that makes them non-reflective significantly boosting efficiency and at the same time making them highly non-stick and self-cleaning. The team’s work indicates that a patterned layer on top of the active part of the panel can avoid the energy losses due to reflection from the surface. It directly boosts absorption of sunlight in the visible spectrum and into the near-infrared part of the spectrum, all of which contributes to a boost to the overall electrical efficiency of the panel. The team suggests that printing the surface of the photovoltaic cell so that it is covered with nanoscopic cones would provide the optimal combination of making the panel non-reflective and hydrophobic and so self-cleaning. April 1, 2019 - Self-cleaning Glass Market key developments and opportunity map analysis of market. The Smart CMSThe Self-cleaning Glass Market report provide information about important factors driving growth of the global market and different key player in market.